Enjoy a stopover in our tranquil bush setting edging the National Park with a backdrop of the glacier valley and mountains. Park up and relax after your day's glacier adventure OR have a room in our lodge. 25 powered sites, the most amazing hot showers (no meters), toilets, kitchen, Sheltered BBQ area, coin operated laundry and dump station, Wireless Internet, NO TENT SITES. Right in the heart of the village, On site bike hire, Adjacent glow worm forest walk and glacier access walkway/cycleway. Experience glacier tours on the West Coast's longest glacier, take a scenic flight, sky dive, hire a mountain bike and ride to our glorious mirror lake, Lake Matheson and take in the awesome views and then treat yourself at the Matheson Cafe and Reflectionz Gift Shop. If time allows it's a 21km drive to Gillespies Beach, home to our local artist, a historic cemetery, a seal colony and coastal walks. We are situated in Sullivan Road, which is just off SH6 opposite the Service Station at the south end of the village. Look out for the three flag poles and follow the wooden fence. 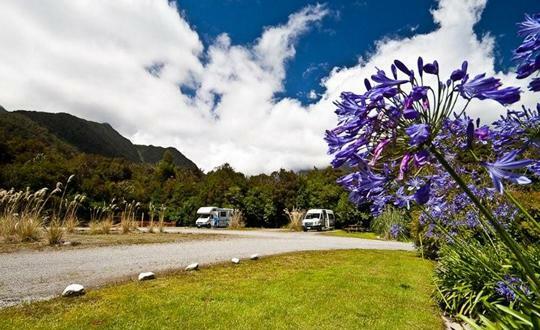 A warm and friendly welcome awaits you at the Fox Glacier Campervan Park. Come and share our little slice of heaven.Tariff: $20 per adult, $6 child (2-15).